Fastvue Syslog. A Simple, Unlimited & Free Syslog Server for Windows. A Simple, Unlimited & Free Syslog Server for Windows. 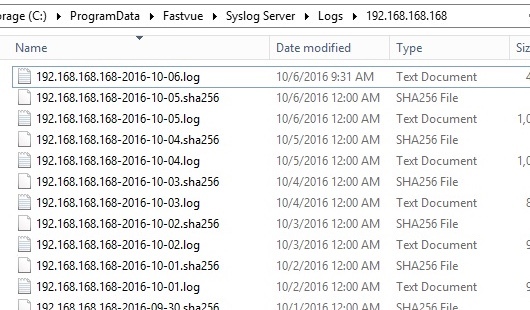 Detect incoming syslog data and automatically log the messages to organized text files. 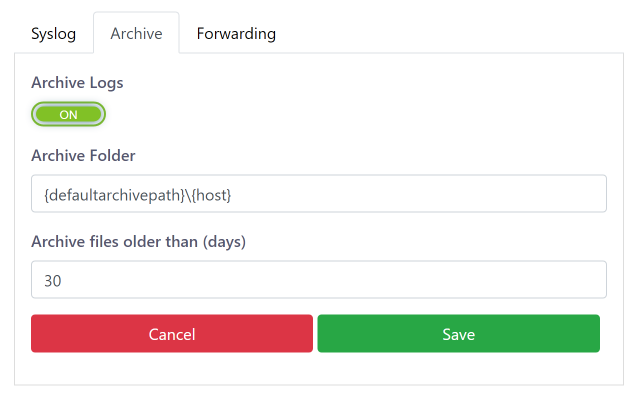 Fastvue Syslog Server automatically zips logs older than 30 days (configurable) and moves them to an archive folder, reducing disk space requirements. Automatic SHA256 hash file for each log for validation. Easily forward syslog messages to other syslog servers. No need to stop using your other syslog apps to start using Fastvue Syslog. Even if your devices only support a single syslog server. Why Log to Text Files? Text logs are an open format. Your data is not locked within a vendor’s proprietary database. 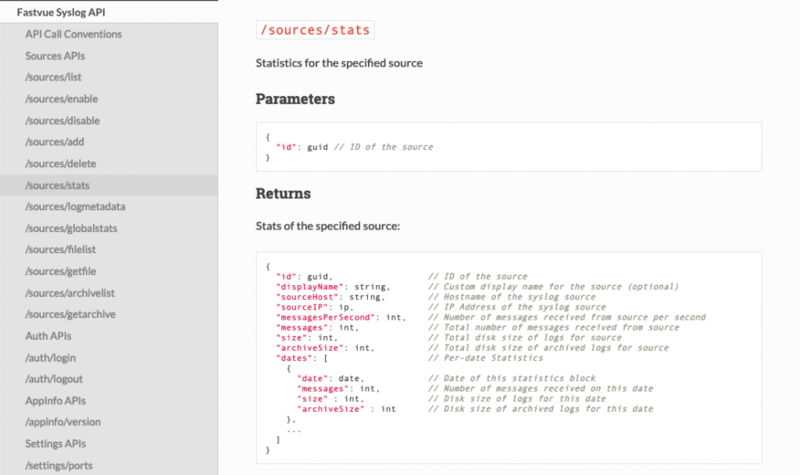 Text logs are human readable and easy to search or grep. Text logs are accepted as evidence in legal proceedings. There are a large number of log analysis and reporting apps available that can parse text logs, such as WebSpy Vantage. Text logs have a low overhead. No need to run heavy database engines consuming valuable CPU and RAM resources. Easily see the size of logs and archived logs, overall and per device. 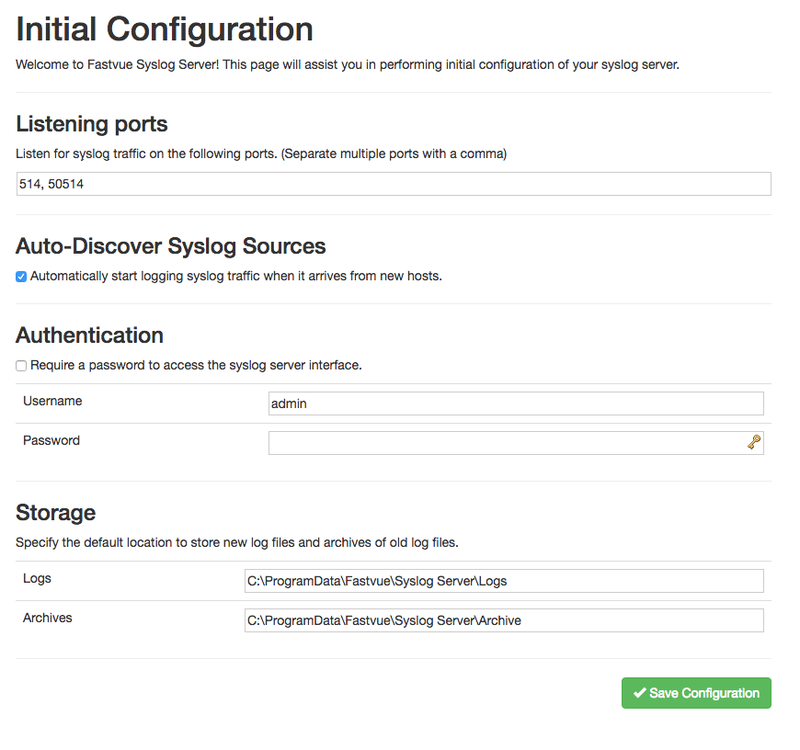 Access logs and archives, and configure Fastvue Syslog with an intuitive web interface. Make changes to the User Interface by cloning our open source GitHub repo. Install, answer a few quick questions, and you’re logging! 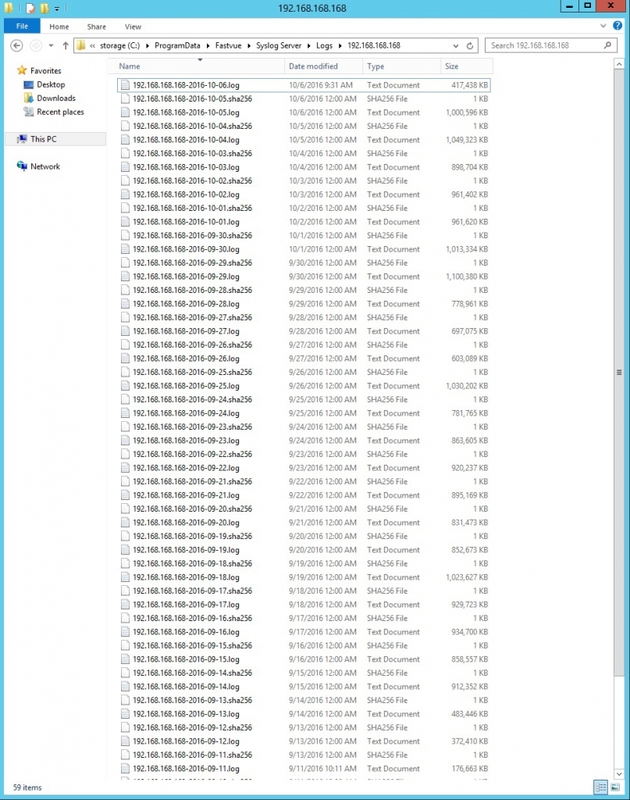 Log and organize all your syslog data on Windows, free. Yup, really! Does Fastvue Syslog Analyze or Report on Syslog Data? No. 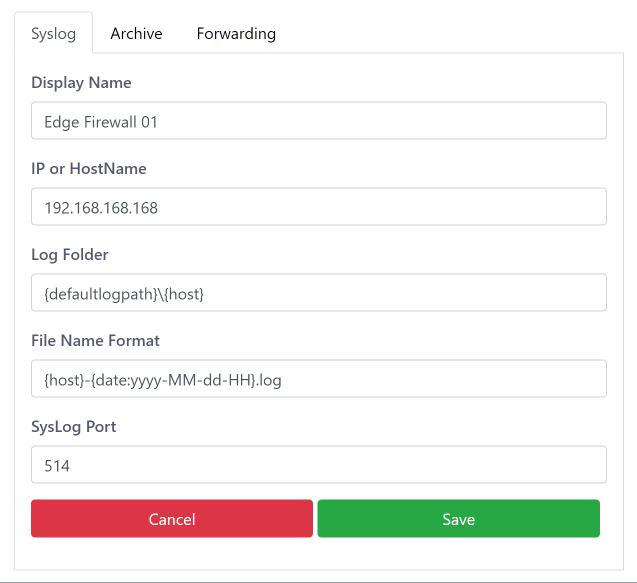 Fastvue Syslog simply collects syslog messages, logs them to text files, then zips and archives logs older than a certain number of days (30 by default). You can then import these text logs into a log analysis and reporting application such as WebSpy Vantage. Does Fastvue Syslog collect data other than syslog? No. Fastvue Syslog listens for syslog messages on the listening ports you specify (514 by default). It does not connect to databases, Windows event logs or APIs. It deals with syslog. Nothing more, nothing less. Does Fastvue Syslog show log messages as they come in? Fastvue Syslog shows statistics on the number of messages and the size of logs collected each day, but it does not provide a log viewer or filtering interface. Just open the text logs in your favorite text editor or ‘tail’ application. How does Fastvue Syslog work? Fastvue Syslog installs a Windows Service that listens for syslog messages and writes them to text. The service is configured via a web interface that runs on port 47279. 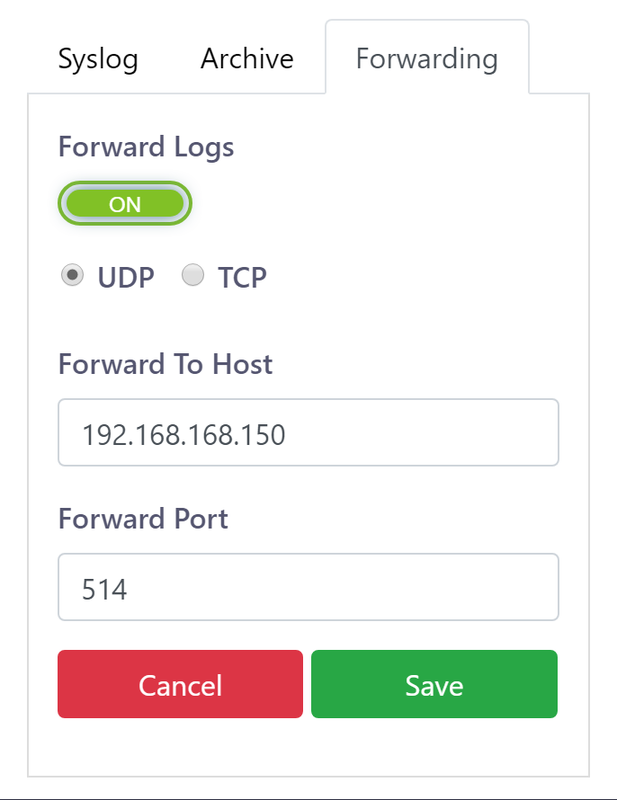 The first time you access the web interface, you are presented with the options to set the log and archive paths, listening ports and a username/password for the web interface. You can also edit these options via the cog button in the top right corner of the application. Once configured, logs magically appear in your logging location. See the Getting Started Guide for more information. Now that logging syslog data to text is covered, the next logical step is to easily analyze and report on those text files. WebSpy Vantage is an incredibly flexible log reporting framework enabling you automatically distribute the perfect reports to the right people in your organization. 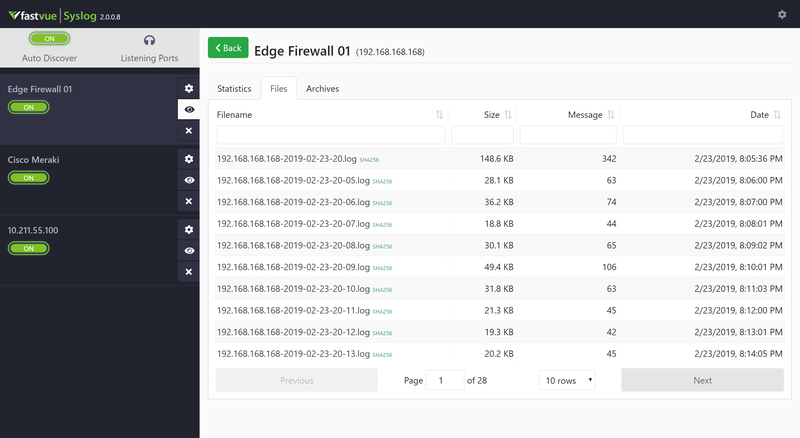 If you’re interested in collecting syslog data, you might also be interested in our ‘Fastvue Reporter’ solutions designed for these leading firewalls and web gateways. Which Sophos product are you using? Fastvue Sophos Reporter supports all Sophos UTM (previously Astaro) models and versions. Fastvue Sophos Reporter now supports all Sophos XG models (NEW!). Fastvue Sophos Reporter for Web Appliance supports all models and versions of the dedicated Sophos Web Appliance.